Inside: Pinterest is chock-full of frugal living tips, but when you’re a tired mom, sometimes you just need to know it’s o.k. to skip a few. Frugal living bloggers love to write articles like “15 Things Frugal People Don’t Pay For”. Before I had this many kids, I loved reading them, too. I really enjoyed seeing how other people saved money by living frugally. I saw every tip as a personal challenge, and back then, I had the energy to tackle them. Then I had another kid who just won’t sleep through the night (yes, ANOTHER – why me?!). Then, I was just too tired to do the extra frugal living stuff. I could barely keep my eyes open, let alone hang my clothes to dry. I could barely move them from the washer to the dryer on time, for heaven’s sake. For tired moms struggling just to keep up with the dishes and the laundry with a baby that doesn’t sleep, a lot of those frugal living tips spell two things they just don’t have: time and energy. The thought of adding ten more things to your to-do list just to save a few pennies makes you want to cry, literally. And that’s why I’m writing this: to tell you to give yourself a break, if only for a little while. You don’t have to do it all, not right now. I know what it’s like to be too tired for frugal living, and in the past, I’ve felt guilty for every frugal living tip I skipped. I know how it feels to always feel like you could be doing more: saving more, spending less, making every possible thing from scratch. Sometimes, especially after babies are born or you move cross-country or your husband is working overtime all the time, you just need permission to break the rules, to skip the extremely frugal option. This is your permission, tired frugal mama. One day, you’ll feel up to following all those frugal living tips again (promise!). But for now? Read this list of frugal living tips I break, and know that you’re not alone. When we had our first child, we didn’t really plan on having a big family. If we knew now what we knew then, I might (keyword: might) have considered cloth diapers. However, we currently spend less than $25 per month on diapers for our sixteen month old using brand name disposables, a number I’m o.k. with. They’re just easier and faster. I really don’t want to add another few loads of laundry a week to my laundry routine. Plus, I early potty train (the lazy way), which gets kids out of diapers several months sooner than average. I used to clip coupons like it was my job. I do occasionally use the coupons BJ’s puts by the front door, but otherwise, I give myself permission to feed my family whole foods, buy in bulk to save money, and skip the coupon world almost entirely. Maybe one day, I’ll give this a whirl. But for now, Mrs. Meyer’s makes such an affordable concentrate for mixing up their multi-surface cleaner and these wipes and this toilet bowl cleaner save me SO much time cleaning bathrooms, I choose to buy my cleaning supplies. I do love to shop thrift stores for other items like end tables and baby gear, but clothes? Nope. The time-consuming process of sifting through so many articles of clothing to find the one thing that just might work…feels like a waste of time once I try it on and figure out it’s too small. Plus, with this many kids, new clothes just last longer as hand-me-downs, making them more frugal for us. I’ll take free clothes from GAP and Old Navy, with a limited mix of quality, long-lasting kid’s clothes from Primary.com mixed in. My husband (and a few kids) are like little ovens. We just moved to a warmer state, and I can already tell that we will be keeping the air conditioning far lower than I personally would like. However, we are home a LOT and like to be comfortable while we’re in it. No skimping here! We go to the movies so rarely that when we do, we like to get the full experience. Wince though I might, this means expensive popcorn and candy. We could smuggle it in, but that would mean breaking rules (and potentially laws) and taking away from a business that we patronize (sparingly). Popcorn, please! Just like going to the movies, we rarely travel. We do pack snacks and drinks, but hours old peanut butter and jelly just doesn’t do it for us. Some good old fast food is part of our road trip experience, and we budget accordingly. Once upon a time, I made my own baby wipes. They worked, especially when made with Bounty Paper towels (I’m name brand loyal here all the way). But when it came time to make them again, and again and again and again, I tired of spending precious minutes saving pennies. I love my Huggies baby wipes – Pampers loses this one big time – and get a box every few months in my subscribe and save shipment. We are trying to cut down on using baby wipes for anything other than wiping bums. I recently ordered washcloths to use in place of baby wipes for cleaning up dirty hands and faces. While I do reduce the meat in some recipes like chili, it’s out of pure preference for less meat. My husband loves meat in his meals and is far less satisfied without it. This leads to extra snacks and more impulsive “I’m not satisfied” trips the store, which totally negates the whole frugal point of reducing or cutting meat in the first place. I love my Keurig! While there are reusable k-cup options, it totally negates the time-saving feature in my opinion. Plus, I know how to get cheap k-cups, although I do occasionally splurge on Dunkin Donuts ones, too. I line dry certain clothes items to extend their life or because their care specifies line drying, but some weeks, I do upwards of 15 loads of laundry. Trying to hang everything and keeping track of the weather would be pure insanity. In general, I love to get a good deal. However, I also love supporting causes and businesses I care about. Since I’ve started blogging, I see small businesses in a whole new light and try to support them when I can. I have friends starting up Etsy shops left and right! I also try to balance price and quality. If I pay $10 for something that breaks tomorrow and then need to buy another (for $10 more), buying the $20 quality item is a wiser, more frugal choice in the first place. If I wanted reusable bags, I’d buy them on Etsy. I buy ziplocs for the same reason I occasionally buy paper plates: for the convenience of using them and tossing them. That being said, I am trying to make it a habit to use my pyrex food storage containers by default. A critical ingredient to successful frugal living is not depriving yourself all the time. We eat out, but sparingly. We budget for it, use some frugal living hacks to get more for our buck when we do, and try to make it count by getting something we can’t replicate at home. I long to be a DIY person. The frugal in me delights at handmade items for pennies on the dollar. But I’ve stopped buying the supplies for DIY projects. Why? I never make the time to do it. I’ve finally accepted that I’m not a DIY person – there are other things I want to spend my time on (reading, blogging, spending time with my kids). I also have no desire to invest the money in tools to do the projects or the space to store the tools. This is another product of having four kids 7 and under. When we lived in Boston, they created a system for automatic renewals and the length of time a book was checked out was three weeks. I could have kissed them I was so happy! Alas, the state we moved to has not caught on to the beauty of automation. But since I have, on average, 75 books checked out at a time, a couple of dollars in fines here and there is an absolutely justifiable cost to “rent” those books. For a long time, I only listened to music on Pandora and Youtube. While our music purchases are few and far between, I did recently purchase this whole album for the kids. It’s safe for them to listen to over and over whenever they want (Youtube is definitely not safe for kid browsing), and they have turned it on themselves the past few days without any prompting. Purchasing music also supports the work of the artist, again something I’ve become more passionate about since getting into small business myself. A lot of frugal people swear that paying for things like membership to big box stores (BJ’s & Costco) and Amazon Prime is a waste of money. Personally, I’ve found that BJ’s is the best place to get the majority of groceries at the lowest possible price in the large amounts we need (feeding a family of 6 is only going to get worse, I know). The money I save on Amazon through subscribe and save pays for the membership itself. You just need to do your research to make sure its worth it for you to purchase the membership you’re considering. There’s nothing worse than paying for a membership you don’t actually use or benefit from. What you don’t see in this list is everything we aren’t buying to make ends meet. We are choosing to forgo some bigger purchases so that I don’t have to watch every penny. 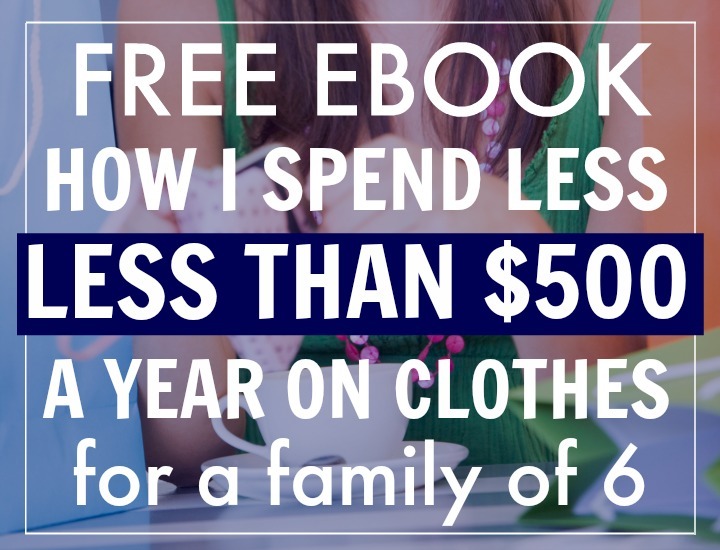 You know your budget – what you can and cannot afford – but I would encourage you to look at skipping some bigger purchases so you have a little more wiggle room to skip the things tired moms just can’t handle right now. If you were drawn to this post in the first place, you are probably already doing SO much to be frugal. Sometimes, it’s o.k. to skip the frugal living tips. It’s o.k. to toss that ziploc bag in the trash, run the dryer one more time, get the individual applesauce cups because you just need something to be easy – SOMETHING. One day, you’ll start to feel better. You’ll have more energy. You’ll choose one (just ONE) frugal living tip at a time to adopt and save a few more dollars. Until then, stop feeling guilty. You’re doing the best you can, and that’s all any tired mom can do. I must tell you that not only mom’s get too tired to do “everything ” frugally. I am a grandma with a chronic disease that leaves me tired frequently. No energy left to Diy. It’s OK really if nothing but the basics get done. Eventually the DIY list will be done and if it doesn’t that is just fine. It doesn’t mean I am less of a person, just someone with different priorities now. Haha I think it all comes down to figuring out what works for your personality. Its like how I’ve read that the best diet is the one you can stick to. Guidelines you can follow without feeling deprived. I live by several of these rules, but they don’t feel restrictive to me. Several of them I embrace for environmental reasons, so I do them not just to save money but also because its how I want to live my life. Absolutely! It is definitely personality based. 🙂 The more kids I’ve had, the more I’ve had to decide what is worthy of my time and energy. Prioritizing is hard. These are great! I am especially with you on the “don’t always buy the cheapest thing” thing. This is particularly true for us for bicycles and shoes. We are a car-free family (for many reasons; the financial aspect is a nice bonus), so we need quality shoes and bikes for all of us. I do about half and half for paper towels…. I like having paper for things like drying chicken or cleaning up milk, but I have a bag of rags for water spills or wiping baby faces. It probably adds a load of laundry every two weeks. I’d love to hear how you save on meat and how you get diapers for $25/month! We do use cloth diapers (because I love them, not so much to be frugal ;-)), but usually disposables at night. Thanks for sharing Heather! I admire you for being car-free. We are a one-car family, but while it’s not a major problem, it is inconvenient at times. For the diapers, we have an Amazon prime membership (you can search Amazon on the site to find a post about it). Once you get Prime, you can join Amazon Family, which automatically gives you 20% off diaper subscriptions for subscribe and save. We get a box a month of Huggies (size 4 right now) for around $23, though the prices do fluctuate. We get 154 diapers, and that usually lasts us through a month, with rare exceptions. We moved from DC, where living without a car was a no-brainer. It’s definitely more work in our current town that’s completely built around cars, but we hope not to be here for long. Do you use Costco at all, or do you find you can get everything through other sources? With four kids and no car, Costco is the one trip I do with a friend (not that it’s not fun!). We regularly buy some snacks through Amazon subscribe and save along with diapers and pull-ups. I use BJ’s for the majority of my shopping, but do stop at Kroger first for some better deals on produce and canned goods. Costco is the only I haven’t tried (we tried Sam’s club this year too). We love BJ’s – just learned about a service they offer of shopping online and pay/pick up in store. I’m going to try it next week – hoping to love it!